Amanda Palmer (known from The Dresden Dolls) has been working on her new album "Theatre Is Evil" for a year now. When I first saw her band in September last year in Brighton and London - The Grand Theft Orchestra was a trio, but now it has grown to a quartet by adding a bass player. To celebrate the forthcoming album, Amanda had launched a kick-starter campaign to provide funding for the album since she is no longer a slave of a major record label. One of the more expensive packages ($300) would buy you not only the art book + a signed album but also access to one of several special gallery exhibitions displaying the original album artwork and also including an acoustic performance by Amanda and even including a ticket for the rock gig to be held a few days later. 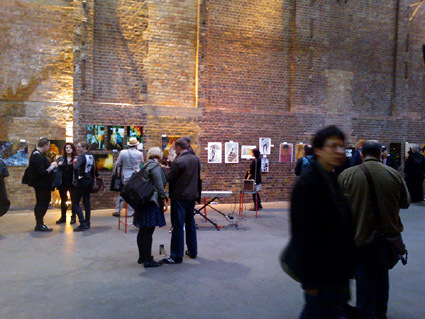 I went to London to catch the London gallery art show taking place at the Village Underground in London's East End. Outside the venue the backers in the queue could enjoy a bagpiper playing his dudelsack until they let us in. Once checked on the guestlist we received a gift bag containing a hand-picked second-hand book, a marker pen and some other stuff. 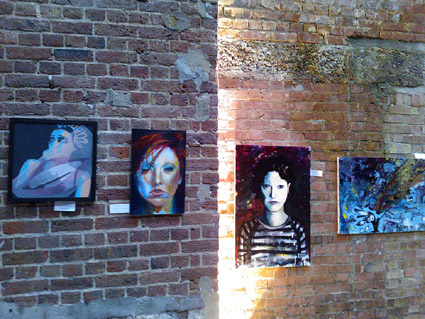 For the next hour or so we could enjoy the nice artwork on the gallery walls and we could visit the bar and have a few drinks or beers. 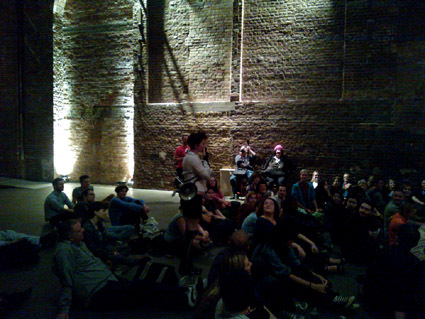 I think we were around 100 backers + a few extra guests making it a rather intimate gathering. At some point Amanda entered the room with her husband Neil Gaiman (the writer) and Amanda gave a short welcome speech and thanking us for being backers of her project. Princessin Hans was the name of a Berlin based duo that Amanda had brought with her from the Berlin kick-starter event. They were a very entertaining support act and provided a lot of fun to watch. Later everyone was asked to sit down on the floor and Amanda's bass player Jherek Bischoff showed us some of his talent. 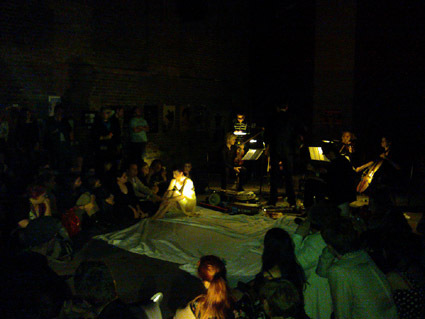 He conducted a string quartet playing music he has written. It was very intimate and quite beautiful despite the rather annoying noise from the bar and 2 professional cameras making clicky noises. I bought the album afterwards to check it out a bit more. Amanda then played her acoustic gig only lit by some flashlights held by the sitting audience. She was being joined by her band members and she also used a megaphone a couple of times (so much for pure acoustic.) Most of it was quiet, laid back and very intimate. Neil Gaiman also sang the song "Psycho" with Amanda playing her ukulele. When the house lights came back on she played the song "Ukulele Anthem" and then she stripped down completely and asked us to body paint her naked body using our different coloured markers from the gift bags. Quite an ending to this art night. Oh, she also told us that there would be a free "Ninja" gig the next evening. 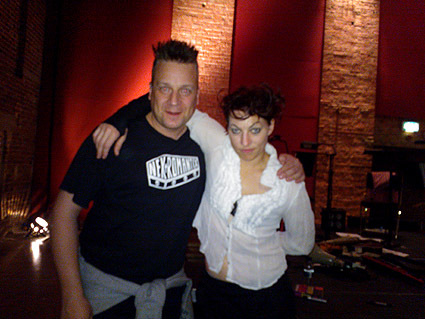 So it turned out I would get to see 3 Amanda Palmer gigs in just 3 days. Awesome. Bagpiper intro, The Killing Type, Trout Heart Replica, Polly [Nirvava], Idioteque [Radiohead], Last Christmas (instrumental snippet) [Wham], Lost (megaphone), Walk On The Wild Side (megaphone) [Lou Reed], The Bed Song (strings), Psycho (Neil Gaiman, ukulele, saw) [Leon Payne], Map Of Tasmania (ukulele), Ukulele Anthem (ukulele). This "Ninja" gig was being announced at the Art Gallery event the day before and also spread via Twitter. It turned out that England was playing against Sweden in the Euro 2012 the same evening which may have held back a few potential guests. It never got too crowded in there but still there were a good amount of fans present to see what Amanda had in store for the evening. The artwork had unfortunately been removed again to protect it from anything that might damage it, but it had been on display all day so fans had had their chance to go and see it. Amanda did a long Q&A section answering questions from the fans and herself, she played some ukulele and she gave away some 70's vinyl records that she had found somewhere. 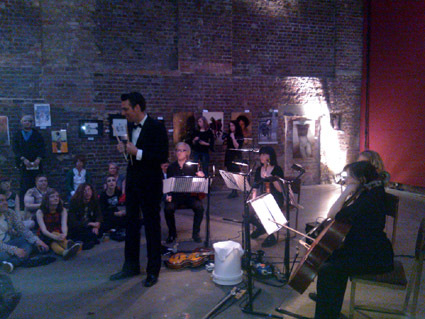 Also bandmembers Jherek(bass) and Chad(guitar, keys) joined for the last part of the Q&A. Afterwards Jherek's strings played a set similar to the night before. Amanda joined on a few of the songs and so did her bandmembers. The megaphone and the ukulele came to use again and she also walked around among the sitting fans while performing some of the songs. Again the gig was fully acoustic. After the music was over we had the offer to buy a poster and have it (or anything else of choice) signed and Amanda also willingly joined for photos with her fans. It was a very relaxed evening this one and a great way to prepare for the long sold-out rock gig taking place the evening after. Dear Old House That I Grew Up In (ukulele), Trout Heart Replica (strings), The Bed Song (strings), Want It Back (megaphone), Last Christmas [Wham], Map Of Tasmania (ukulele), In My Mind (ukulele), Walk On The Wild Side (megaphone) [Lou Reed]. 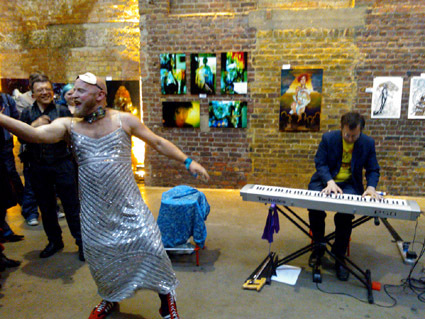 Day 3 - Rock gig: Read about it here. Photos from all days: See them here. The Dresden Dolls - No, Virginia... ♦ Amanda Palmer - Who Killed Amanda Palmer? 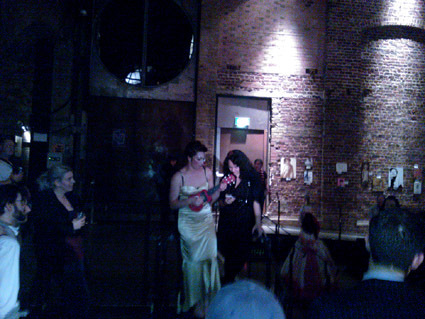 ♦ Amanda Palmer - Goes Down Under ♦ Evelyn Evelyn - Evelyn Evelyn ♦ Amanda Palmer & The Grand Theft Orchestra - Theatre Is Evil ♦ The Few Moments ♦ Bitter Ruin - Waves ♦ Amanda Palmer and Edward Ka-Spel : "I Can Spin A Rainbow" ♦ Amanda Palmer : "There Will Be No Intermission"